Light your black candle and get it burning. You’ll need it’s wax later so it’s best to get it warm now. Concentrate on the flame, see the energy coming from the candle. Let it fill you. Focus on your intent. You want to protect you and yours. 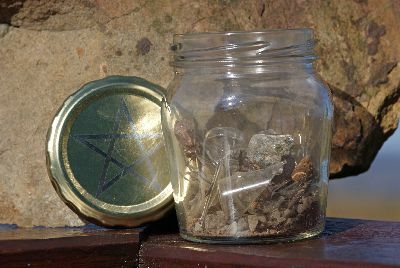 Take your glass jar and add the sharp bits of broken glass and the nails, etc. These things were thought to ward off bad luck and evil spirits. Add the sea salt as a purifying agent, to get rid of negative energy. Now add your black sand. Sand was used as a means to distract evil spirits. It was thought that the evil spirit would have to stop and count each grain of sand before it could pass. The last ingredient is the liquid. If you don’t care to add urine, fill the jar with consecrated wine or vinegar. Add some spit, hair and/or nail clippings to create a personal link if you like but that is optional. Close the jar tightly and seal it with wax from the black candle. When the wax is dry and cool, you can then place your witch’s bottle. Some choose to bury it in the ground under a porch, others place it just inside the door. Find a safe place that’s out of view where it won’t be disturbed. So glad that you posted this spell, as I feel it is one of the most important spells to do in the beginning of anyone’s magical journey. When I did it I added blood, urine and spit, 3 parts of me, it helps to draw any negativity in, confuse and ultimately destroy it. The idea is that if it is attracted to you, it will be attracted to this bottle of you (and sharp objects) instead.